Tree-planting programmer & military commander of the Imperial Army of Japan. Minoru was born in Kawashima town of Awa Province (present Tokushima Prefecture) at the last part of the Tokugawa Shogunate period. 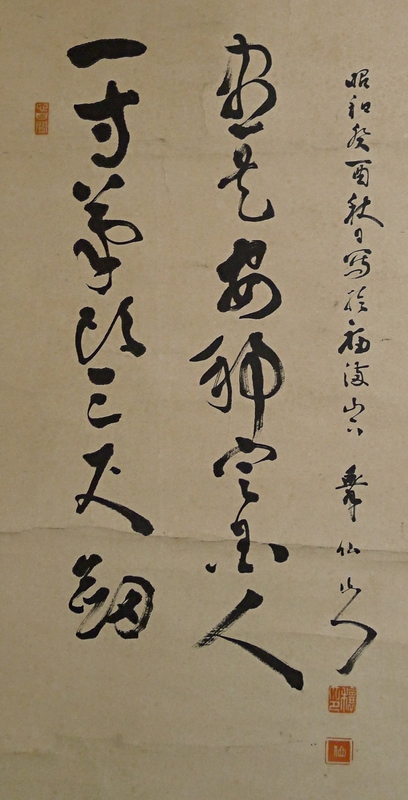 He became an elementary school teacher, though, he also studied Japanese-style painting under Kawabata Gyokusho. Later, Minoru entered the Imperial Army of Japan and served on active duty in China as a artilleryman. While the Japanese-Russo War between 1904 and 1905, he joined an artillery troop and succeeded to win the Lushun modern fortress from Russia. In 1910, he was appointed responsible official of the army post at Hijudai in Oita Prefecture, and he started tree-planting project around the place. The project lasted for 25 years. Description This scroll was drawn in the autumn of 1933. It is slightly foxed overall as it was depicted years ago. There are a few small holes at the top of the mounting. Grazes are found in whole. There are folds and faint spots to some extent on the painting part. 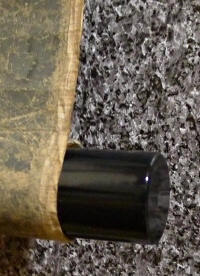 The two roller ends have been exchanged to plastic ones. Although, Daruma is drawn very powerfully using Fude Japanese brush and Sumi black ink only.